The shooting of the film Mugamudi which is supposed to be the dream film of director Mysskin is to commence ion 12th. Mysskin who emphasizes that Mugamudi is the first super hero film in the Tamil history has Jeeva in the lead role. Pooja Hegde is pairing with him. Narain is donning the villain role. Mysskin has signed Kay for composing the music for this film. He had already composed the music for the film Yuddham Sei directed by Mysskin. Dhananjayan of UTV Motion Pictures who are the producers of this film said, "Mugamudi is supposed to be the dream film of director Mysskin and Jeeva. We are commencing the shooting of this film on 12th morning in the presence of the media people. Mysskin will be completing this entire film in one schedule. This film is being released during the summer vacations. We will also be releasing the first look posters in the presence of the media people. Jeeva is donning the role of a super hero. It is astounding to see his interest and hard work. We will also be screening that how Jeeva readied himself for this film during the press meet which is to be held on Monday." The Kolaveri number is fast making it bigger and bigger each day. The latest news from Mumbai is that Dhanush, the singer of the song and hero of the film met Amithabh Bachchan at his residence. He was later seen with Abhishek Bachchan at a film premiere in Mumbai too. 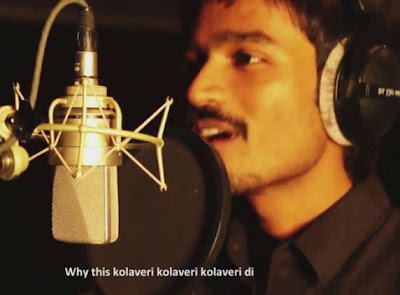 Ever since Kolaveri Di was uploaded on YouTube, the popularity of the song has been on the raise. The trippy number got nearly 17 million views and caught the imagination of the youth who made it a sort of anthem. You Tube has honoured the track with a Gold Award for getting the most number of hits. Now the song has been hailed by the prestigious TIME magazine. "Perhaps the ballad's universal theme is part of its appeal – apparently it's about a guy who's been dumped by his girlfriend. The song is also notable for its pretty nonsensical use of words, employing a unique language probably best described as 'Tamglish' – mixing Tamil and English." People are commenting on the fact that Time magazine of USA has reportedly written about an Indian song like this after twenty years, the previous instance being about Rahman and Roja. Expectations are high on director Vasanthabalan's Aravan. The period flick that features Aadhi, Pasupathy and Dhanshika in the lead roles is all complete and details about its release are kept under wraps. Sources say the movie that has music by Karthik has come good. They add plans are on to release it this December itself. Vasanthabalan is planning to kick off unique ways to promote the movie. The movie produced by T Siva of Amma Creations is one of the bog-budgeted movie and expectations are soaring high. Osthi, Tamil remake of the Hindi blockbuster Dabangg. The Hindhi Original had a blast at the box-office becoming the biggest entertainer of the year, simbu too giving the Tamil counterpart his all to make osthi as successful as Dabangg was in hindhi. Silambarasan and Dharani have managed to rope in Mallika Sherawat for the item song, famously done by Malaika Sherawat in the Hindi version. And the song, sung by LR Eswari and STR's dad TR, has already proven to be a hit with it repeatedly being broadcast in radio. The entire fans was charged up with the item song rendered by LR Easwari and T Rajendar being played at the background for which the stars danced. The item track will be a treat for your eyes, when seen Mallika Sherawat moving her hips on-screen. The moment you play the much-hyped, 'Kalasala', it invites you to shake your legs. Ilayathalapathy Vijay's voice is adored by his fans , many songs from his earlier movies proved to be hit songs because of his voice . He crooned for Vadi Vadi for Sachin which was a instant hit there after he has stopped taking up singing assignments. 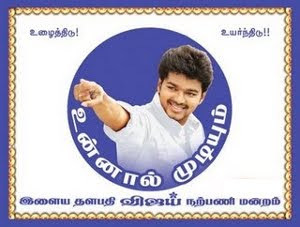 But the latest we hear is that , G.V.Prakash is pretty sure that he will make our Ilayathalapathy Vijay again in a movie which will be directed by A.L.Vijay. 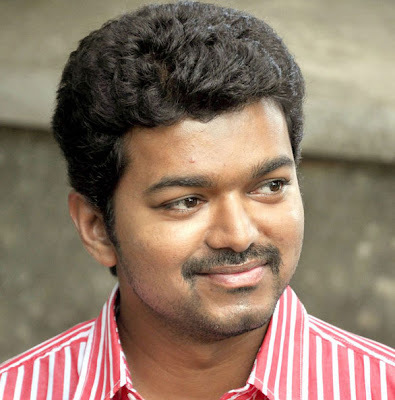 Adding more , It is said that the commericial pot boiler will explore other dimensions of Vijay . This movie will kick start when the duo finishes their current assignments.